Hello all, I recently disassembled my clutch to install the judges washer kit that I purchased from bad ace before they stopped operating. I figured while I was there I should inspect the clutch discs although my bike has less than 10k miles, I've noticed some slippage. I'm no motorcycle expert, but I do have some technical experience. When disassembled I found all of the steel disks had multiple blue parts which says to me they have gotten very hot at some point. I ordered a set of Barnett carbon friction plates, but was surprised to see that they came when 8 because when I disassembled mine there were only 7???? I also need to order a set of steel rings, but was curious what thickness I should order, as I would have expected just one size available. 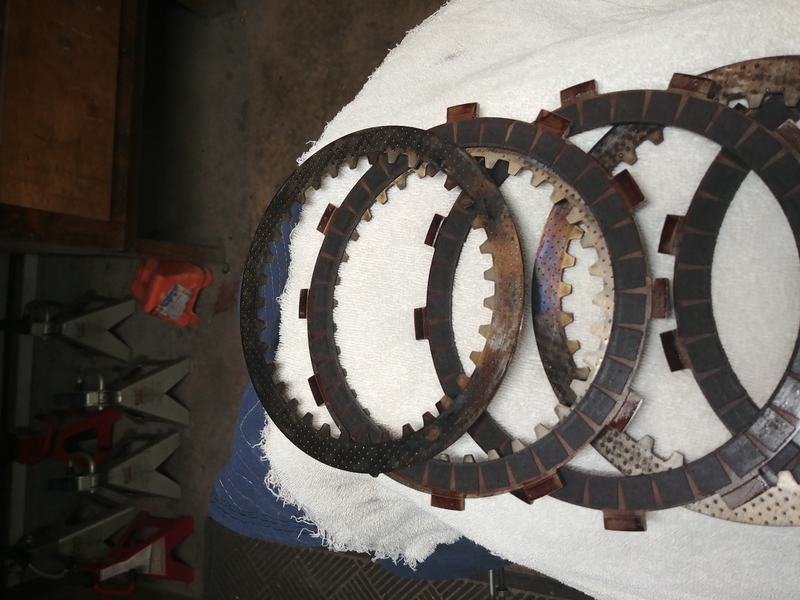 I had misplaced one of the friction plates while disassembling the clutch. I saw it this morning, and so now it makes sense why the new Barnett one came with 8 plates. only question now is if the order of assembly matters. There's nothing in the service manual about ordering the friction and steel plates, just alternating. The torque limiter spring placement is very important though so be careful with them. It's easy for them to slip and get bent when tightening the clutch nut if they're not stuck together and on the holder well. If your local Kaw dealer parts department is friendly, ask them to pull up the clutches on their computer and one of the steel plates should have different part number than the other six. The exploded view should show what position the odd one is in. There are apparently 3 different sizes of separator plates, 1.6mm, 2.0mm, and 2.3mm, to allow for setting the clutch pack thickness and free-play. The friction plates appear to be all the same. I'm assuming that Barnett selected the separator plates by measuring the clutch pack all together and adjusting accordingly to get within total thickness spec. I'm guessing that it makes no difference where you put the thinner one, though I'd put it somewhere in the middle. I prefer the more rigid plates at the ends to reduce flexibility at the application points. was their any indication that the clutch was failing ? reason i ask my wife's 2002 has 38000 kms and my 2005 has 82000 kms . as far as i know they have not been changed . So I ordered the judges washer kit, and wanted to install it because I wasn't impressed with the engagement. I did feel like at times it was slipping. I opted to disassemble everything while having it apart so I could inspect it, and was a little surprised to see all the bluing from heat all over the factory steel disks. At that point I decided to just replace it all with a Barnett kit. Mean Streak Clutch - How do I know when its wearing out?